The basement of Ames Hall has bats. Dozens of them. In one room, approximately 30 tropical bats, native to Costa Rica, flutter from one wooden perch to another. Some hang upside down from air vents in the ceiling, their tiny claws intertwined in the metal screens. In another room, a dozen guinea pig–sized Egyptian fruit bats, with little dog-like faces and wingspans as long as a human’s arm, feast on chunks of cantaloupe and orange on a tray. In yet another room, behind a sign that reads “Bat Crossing,” 30 or 40 big brown bats—native to the Mid-Atlantic—hide bunched behind a white sheet. 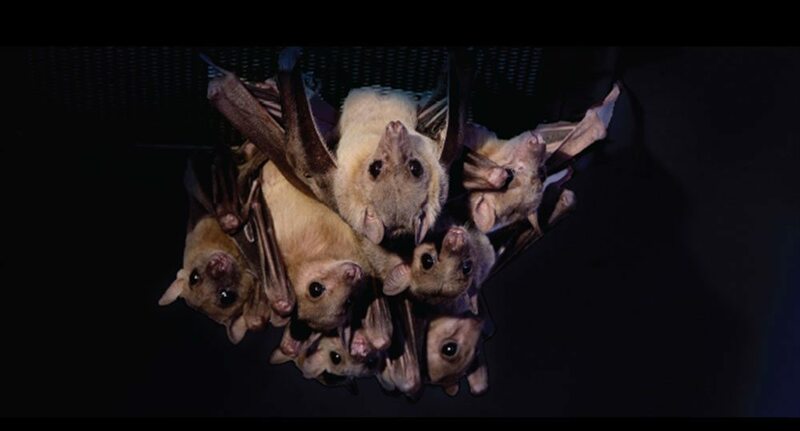 These bats are not pests but subjects of inquiry for Cindy Moss, a professor in the Krieger School’s Department of Psychological and Brain Sciences. Moss, an expert on how bats use echolocation to navigate their way through the world, arrived this past summer at Johns Hopkins after 19 years at the University of Maryland. 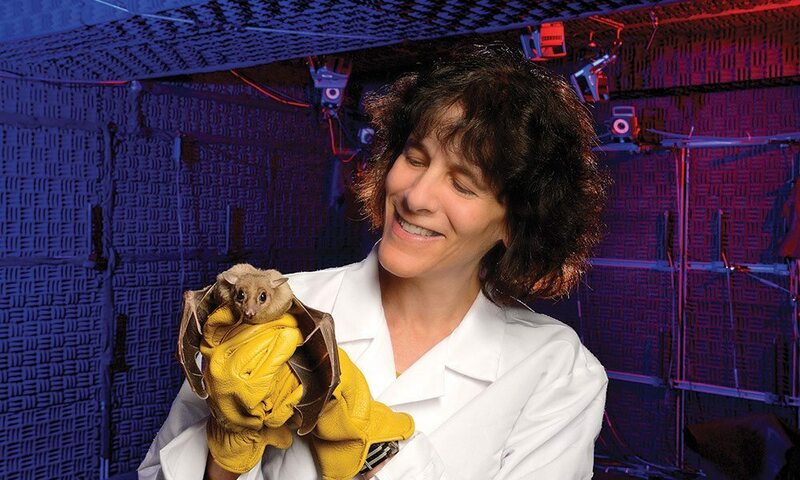 In what she calls her bat lab, a suite of rooms in Ames’ basement, she films the bats in flight with high-speed cameras and uses sensitive audio equipment to record the high frequency calls bats make with their voice boxes or tongues, bouncing the sounds off objects and using the feedback to alter their flight paths accordingly. At the very broadest level, Moss says she’s interested in how animals perceive the world around them and how they use that information to find food, navigate, and survive. She just happens to use echolocating bats as her model because, for Moss’ purposes, they make the most effective test species. By studying the frequency, duration, and content of the vocalizations a bat makes during echolocation, Moss can glean a pretty good idea about what’s going on in its mind. Moss holds one of the large Egyptian fruit bats. Moss says most people are surprised when she tells them about what she studies. “At my first faculty appointment at Harvard, when I arrived at the business office, all the people were expecting me to arrive in a black cape!” she recalls. Her second-floor office in Ames provides few clues as to her area of interest—just a paper bat mobile, a sign on her desk (Warning: Bat Cave), and a lone Bat Girl action figure standing on a shelf. On an afternoon in early September, one of Moss’ postdocs, Melville Wohlgemuth, is wearing a headlamp as he prepares the dimly lit bat lab for its first experiment since moving from College Park. With its foamy black soundproofing material on the walls and ceiling, and its carpeted floor, the 20-by-20-foot room looks more like a recording studio than a laboratory devoted to studying animal behavior. Wohlgemuth and a graduate student, Ninad Kothari, have been examining how bats’ brains process the information they receive through echolocation and how that information affects subsequent actions. In his experiment, Wohlgemuth plans to release a big brown bat in the dark room and have it navigate a series of dangling obstacles in order to find its reward—a mealworm. Tiny electrodes, mounted in the animal’s midbrain, will measure brain activity, as 15 high-speed cameras record how the bat orients its head as it flies through the obstacle field. Sensitive microphones, mounted along the walls, will pick up the animal’s sonar vocalizations, which it produces at too high a frequency to be heard by the human ear. (These sounds are different from the audible squeaks a bat makes, which are social calls not used for echolocation.) The entire sequence will play out in less than a second, but by slowing down the video footage and correlating film of the bat’s flight path with changes in its vocalizations and neural activity, the researchers hope to decipher how bats make decisions during flight. “By looking at how the bat changes its aim in flight, we can figure out how it’s accommodating its flight behavior with respect to the objects in the room,” says Wohlgemuth. Back in the lab, Wohlgemuth is eager to get his experiments underway. The big brown bats he’s using—which, at less than 20 grams, really aren’t so big—hibernate from fall through early spring. If the researchers wait much longer, the bats will simply flop to the ground when set loose in the lab. Moss obtains the Egyptian and tropical bats from sources outside the country, but the bat lab has a permit from the Maryland Department of Natural Resources to collect its own brown bats from people’s homes. (Got bats? Contact the lab at 410-516-6463.) In the past 20 years, Moss and numerous students have spent many hours crawling around in hot attics or hanging nets across windows and waiting for the bats to fly out at night. “Sometimes, if they’re really sleepy, we can go into an attic during the day and pick them like fruit,” says Moss. A group of Egyptian fruit bats hanging out in the lab. In 2011, Moss invited Kish to her bat lab in order to ask him a question she couldn’t ask the bats: How do you experience the world? She says Kish was more than happy to volunteer and over the course of several days, she had him navigating through her obstacle-filled bat lab and trying to identify the largest of several objects hanging from the ceiling. Unfortunately, Kish encountered some difficulties. But she says the trials with Kish got her thinking about how bats could use past experiences and spatial memory as well. “If you toss a rock into the air, a bat will probably go after it because experience tells the bat if there’s an echo out in space, it’s probably a bug,” she says. In a similar vein, Moss devised an experiment to test how bats rely on landmarks to help them navigate. She and her students stretched a net across the bat lab, cut a hole in it, and tethered an insect as bait just beyond the hole. Next to the hole, the researchers placed a tripod. In a series of trials, bats successfully flew through the hole, but when they moved the tripod away from the hole, bats flew into the net. “It’s apparent that bats, like other animals, use information other than the sensory input to represent their world,” says Moss, who has conducted further investigations on spatial memory and navigation. Another possible real-world application of bat lab research involves unraveling the intricacies of bats’ acrobatic flight—a study the U.S. Air Force has recognized with several grants awarded to researchers. Moss and her colleague Susanne Sterbing-D’Angelo, a scientist in the Department of Psychological and Brain Sciences and Maryland’s Institute for Systems Research, have devised several experiments designed to test the role tiny hairs on bats’ wings play in flight. In a series of tests, researchers filmed bats flying through an “artificial forest” of nets and fake tree trunks. Then they used depilatory cream—Veet, to be exact—to remove the tiny hairs along the leading edge of the bats’ wings and filmed them again navigating the same forest. What the researchers discovered was that the bats flew faster with the hairs removed, but made wider turns and had less maneuverability in flight. Sterbing-D’Angelo suspects the hairless bats change their flight patterns because they think they are at risk of stalling. Apparently, the tiny hairs help bats discern their airspeed; by removing them, the bats think they are flying dangerously slow, prompting them to speed up. Sterbing-D’Angelo is also working with colleagues at Brown University to understand the dynamics of “perching” and how bat behavior could be adapted for use in drone aircraft. She says autonomous vehicles could someday employ a similar maneuver to recharge on power lines. But before we see drones hanging from power lines like bats, there is more work to do in the newly created bat lab at Johns Hopkins. Moss plans to expand her investigations into higher-level cognitive processes—basic sensing, attention, and memory—and how they all fit together. She wants to expand her work on bat vision, too, testing the visual acuity of Egyptian bats and also learning how they use their olfactory senses to find ripe fruit. Sometime this fall, a new colony of bats from Taiwan is supposed to arrive—larger bats that will be easier to mount with detectors.